Put-in-Bay’s 8th Annual Put in Bay Pyrate Fest sees the return of the Pyrate King for 4 days to find his stolen treasure. Dress as a pyrate and join the fun. This is a fun-packed weekend for kids and adults alike with a Pirate Parade wandering around the park downtown and a Costume Contest for both kids and adults. The best adult costume wins a trip to the Cayman Islands!!! There is a Pyrate marketplace and displays, a kid’s fun fest and black powder firing demonstrations every day during the event. 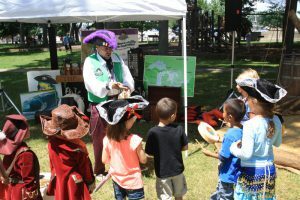 Discover many fun pirate events such as reenactors demonstrating sword fighting techniques and the art of skullduggary. Kids can practice with foam swords too! 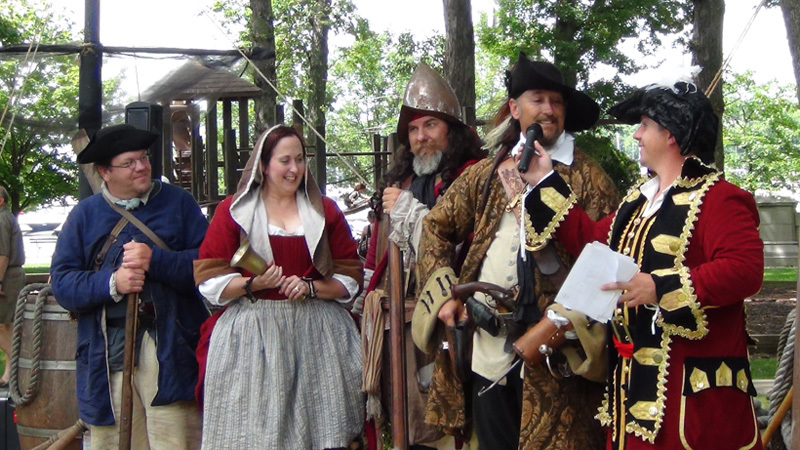 Pyrate Village (home to the Marketplace) and DeRivera Park will also feature more than 50 reenactors on-hand who will be available for photo opportunities and who can even help you pick the perfect pirate name. There will also be living history demonstrations on 18th century cooking, medicine, weapons and navigation. SPECIAL #1 – Book one of the few remaining Island Club Vacation Homes for the weekend, and save $200! Use Promo Code “200PYRATE” when you call 216-898-9951 to reserve. 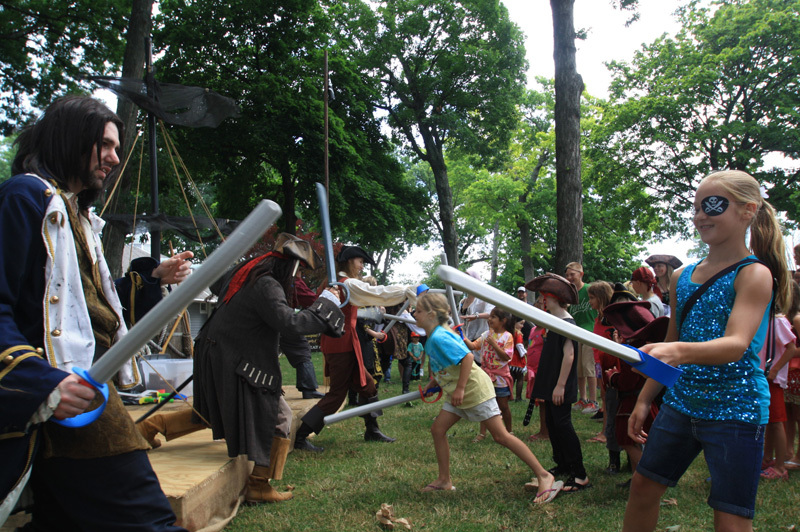 June 17 – Friday of Pyrate Fest opens with “Booms over the Bay.” Pyrates invade Put-in-Bay’s downtown harbor for the 8th year in a row at 4:00 PM to open the festivities. The best place to view the battle is along the downtown waterfront. The official opening ceremony is at 7 p.m.
June 18/18 – Saturday and Sunday, the Pyrate Village with Pyrate Marketplace, Faire Wynds Circus, historic displays on cooking, medicine, weapons, and navigation will be open 11 am to 5 pm. More than 50 re-enactors in pyrate gear will be downtown for photo ops, discussing tactics, and helping you choose a “pyrate name”. June 18 – Saturday fun activities for the entire family, including Kids Costume Contest, and an Adult Costume Contest with the winner headed to the Cayman Islands. Saturday evening brings a spectacular fireworks display on the island at dusk. June 19 – The second annual Pyrate Run benefiting Stein Hospice kicks off Sunday’s activities at 9:30 am. The remainder of Sunday is the annual Kids Fest. June 20 – Monday, four-person teams representing island businesses paddle their vessels around the downtown harbor in the annual Cardboard Boat Regatta at 6:00 PM. Be prepared for black powder demonstrations by National Park Rangers dressed as 1812 period soldiers and cannon firings by Cannon Master Bob Gilmor in DeRivera Park. SPECIAL #2 – Anyone sailing over aboard one of the Miller Boat Line ferries will receive a $1 discount on their round-trip fare if they dress like a pyrate, or talk like a pyrate when asking for their tickets at the ticket booth. Previous Previous post: Visit Our New Web Site!